The Internet giant fails to beat Wall Street estimates against rising concerns about business in Europe, and stock prices take a major hit. Despite economic worries in Europe, Google was still expected to post strong earnings today, but the Mountain View, Calif.-based enterprise didn’t hold up to estimates and stock prices plummeted after hours. 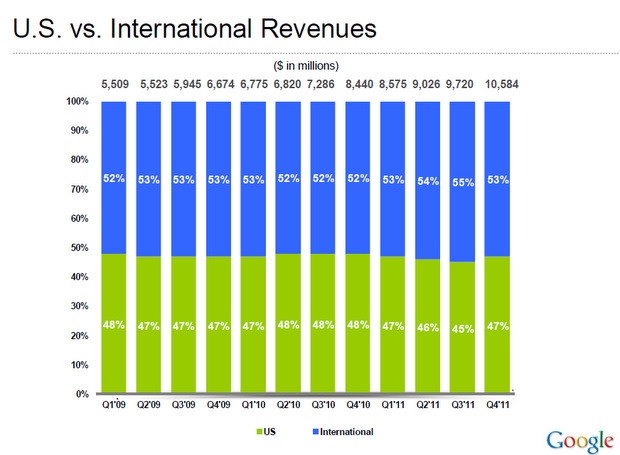 Google reported fourth-quarter net income of $2.71 billion, or $8.22 a share (statement). Non-GAAP earnings were $9.50 a share on a revenue of $10.58 billion (including traffic acquisition costs) — a 25 percent increase compared to the fourth quarter of 2010. Subtracting TAC, which was worth $2.45 billion, revenue actually only came out to $8.13 billion. Wall Street was expecting Google to report fourth quarter of $10.48 a share on revenue of $8.4 billion, including TAC. 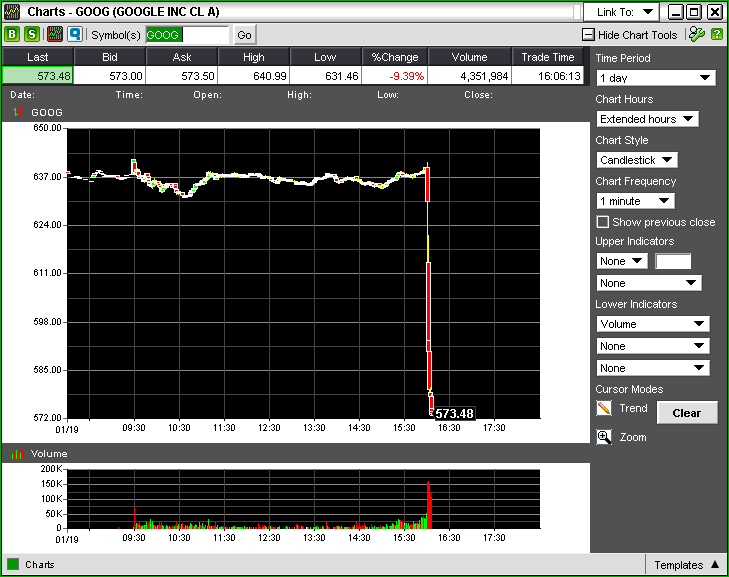 After the market closed, Google’s stock plummeted suddenly. I am super excited about the growth of Android, Gmail, and Google+, which now has 90 million users globally -- well over double what I announced just three months ago. By building a meaningful relationship with our users through Google+ we will create amazing experiences across our services. I'm very excited about what we can do in 2012 -- there are tremendous opportunities to help users and grow our business. As for European concerns, Google only addressed its United Kingdom unit, which makes up the bulk of Google’s EU dealings anyway. Revenues from the United Kingdom totaled $1.06 billion, representing 10 percent of revenues in the fourth quarter of 2011, compared during 10 percent in the fourth quarter of 2010. Google argued that if foreign exchange rates remained constant from the third quarter of 2011 through the fourth quarter, fourth-quarter revenues would have been $239 million higher. For the first quarter, Wall Street is expecting Google to report earnings of $10.07 a share on revenue of $8.28 billion, including TAC. Google employed 32,467 full-time employees worldwide as of December 31, 2011, up from 31,353 full-time employees as of September 30, 2011. Cash, cash equivalents, and short-term marketable securities were $44.6 billion as of December 31. 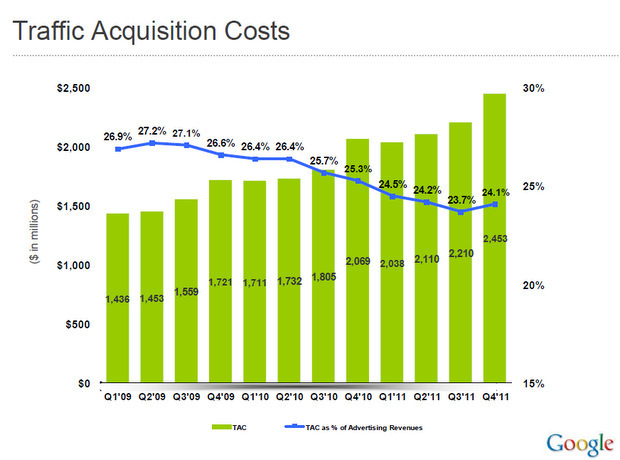 Aggregate paid clicks increased by 17 percent from the third quarter to the fourth quarter in 2011. This story was originally published at ZDNet's Between the Lines under the headline "Google's Q4 revenue disappoints."